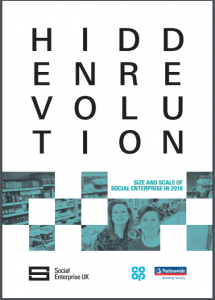 The Hidden Revolution, supported by Nationwide and Co-op Group, presents fresh analysis of the size and scale of the social enterprise sector. According to independent analysis, the social enterprise sector makes a £60bn contribution to UK GDP, compared to £24bn in previous research. The Hidden Revolution also brings together key statistics which show that social enterprises are more competitive than traditional firms, confirmed that social enterprises are the Future of Business. You can read more about this report here.